Peter Dugovic was born in Born in Honeoye Falls New York 12 /31/ 1965. He spent his formative years in New York City both as a bike messenger and sign painter. It was here where he gained an appreciation for gritty urban scenes, wooded areas and hard work. Those early observations now reflect themselves in many of his paintings. 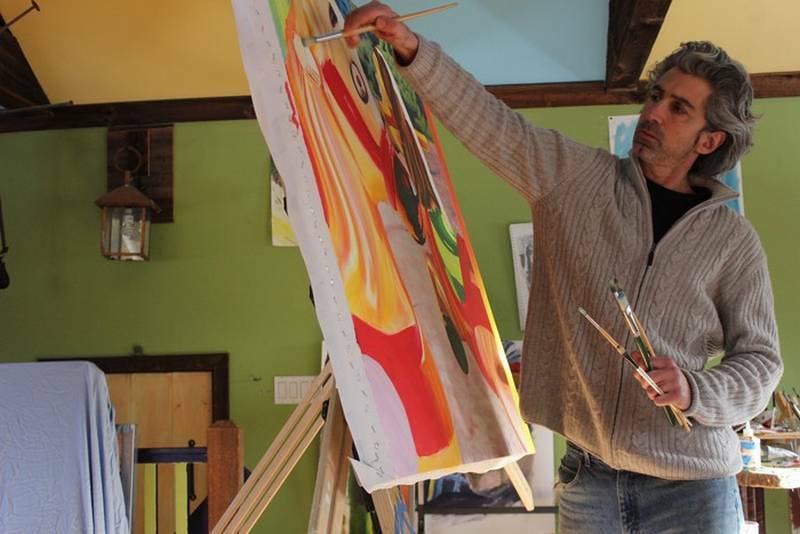 Peter is primarily self-taught in art though he studied Printmaking and Sculpture at both SUNY Genesco and SUNY Purchase. His education was followed by a move with his family to Kennebunk Maine after which he worked as a carpenter and proprietor of his own store. During this time he gravitated back to his artwork and in 2009 he began his career as professional artist. Peter paints from childhood memories as well as from present experiences. His techniques are complex and result in scenes that are powerful and unique. There is however an undertone of anger and passion to the work that reflects the essence of his being. The artist has had over ten solo and group exhibitions and has shown in New York City, Long Island, Kennebunk Maine as well as in Amesbury, MA. Peter makes his home in the quiet and secluded back woods of Wells Maine. He allocates his time accordingly as a professional artist, carpenter and part-time coffee shop owner.